US Olympic Rugby Team Portrait, 1920. Courtesy of IOC/Olympic Museum Collections. The American underdogs scrum their way to a huge win. America’s fanatical love of football during the early part of the 20th century largely wiped out the sport of rugby in the United States – except in California, where there were still some West Coast high school and college students lacing up their boots. The adoption of new rules for American football in the early 1900s sparked the return of popularity for football throughout the U.S. and the ultimate elimination of rugby as a major sport in high schools and colleges. California was among the last areas in the country to complete this transition. So when the 1920 Olympic Games Committee decided to form a U.S. Olympic Rugby Team, they came to recruit first in California. Ultimately, they selected every single member of the team from the Golden State – even though ­many of the players were rugby rookies at the time. One of the very first experienced recruits was UC Davis alum Colby E. “Babe” Slater, 24-years old and just having returned from World War I. 1920 Olympic Match at the Antwerp Stadium. Babe Slater is second player from the right. Courtesy of IOC/Olympic Museum Collections. 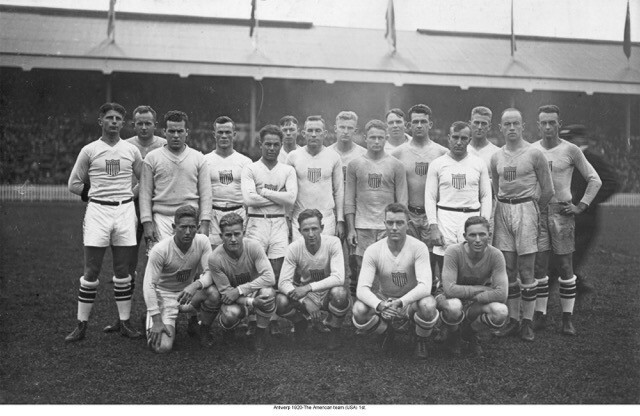 The 1920 Games were held in Antwerp, Belgium and the only team that arrived to challenge the French champions was the novice American team. In large part this was due to France having dominated the European Championships earlier that year; Romania and Czechoslovakia pulled out of the Olympic competition, leaving America to take on the overwhelmingly favored French. 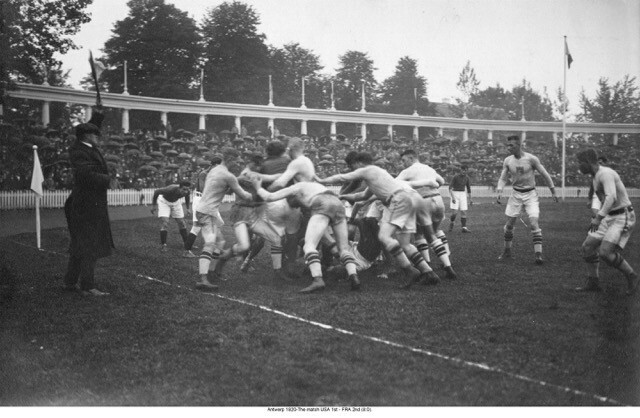 United States v. France in the Antwerp Stadium, 1920 Olympics. Courtesy of IOC/Olympic Museum Collections. On June 30, 1920, the American team left New York on the Army Transport Sherman, arriving in Antwerp thirteen days later. Housed in a local boys’ school, the players were transported by bus to practice each day and finally took the pitch on the very last day of the Games: September 5, 1920. 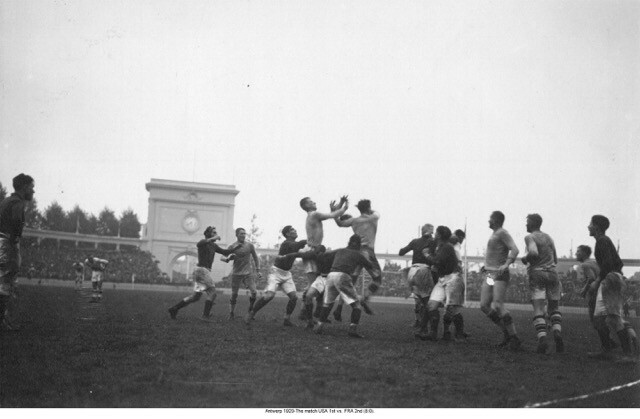 The team was greeted by a crowd of 20,000 – the second largest attendance at those Games – most of who were prepared to witness a runaway win by the French. During the match, a rainstorm restricted the American attack from the backline, forcing the team to showcase their more aggressive scrum tactics and ability to move well in the mud. The first half finished with both sides scoreless, leaving the spectators at Antwerp Stadium in shock. During the second half, “Dink” Templeton scored a 55-yard drop goal, launching the Americans to a 3-0 lead. Later Garv Hunter would toe the ball ahead and over the goal line; Templeton would convert, sealing the 8-0 win and astounding the French and the world. England and the British and Irish Lions.